In the last year, I’ve taken on regular (unpaid) blog contributor commitments with multiple other blogs. I’m recognizing that some of these experiences feel rewarding and enriching and some feel more like I’m being “used” to contribute to the project of another person without a lot of gain for myself. I’ve spent a lot of time in the past couple of weeks both pondering how to be less hard on myself as well as about the role of blogging in my life…where does it fit? Is it inhibiting other work I could be doing or contributing to it? How do I make the transition between focuses, or, is it possible to maintain multiple focuses and multiple blog commitments…? 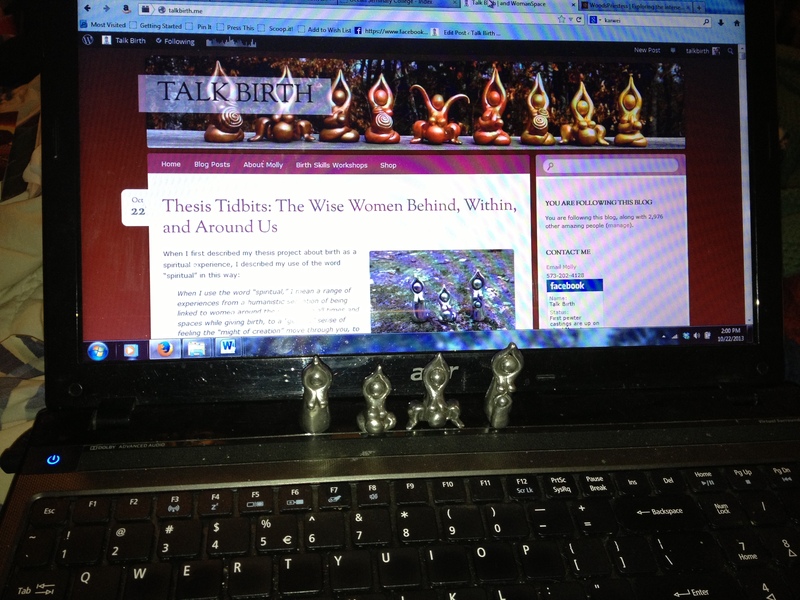 via Blogging, Busyness, and Life: Part 1 | Talk Birth. But free is expensive. Not to the person receiving it, but the person who is creating it. I probably put 30 hours into producing those workbooks, and an additional 10 hours this month writing blog posts and tweaking this blog to make it snazzier for you. That’s an entire 40-hour workweek. For free. But if all you do is free, people don’t see how expensive it is for you – and they don’t appreciate you. via The Dark Side Of Blogging: When Free Gets Ugly. To be clear, I’m not talking about charging for blogging—what I’m talking about is how blogging may use up time that could potentially be spent on activities that generate income. I have book ideas, I have classes to work on, I have products to develop and list on etsy and every time I write a blog post instead, I could theoretically have been building one of those aspects of my life instead. People even imply and suggest (or at least the Twitter gang did) that bloggers should be ashamed of asking for money, for any kind of payment for that solid advice and knowledge. Bloggers should be ashamed of asking for money for the posts they write, the ones that take anywhere from 3 to 15 hours of work a week. Yet, no one feels ashamed reading their favorite blogs every day. They feel no shame learning, benefiting and profiting off someone else’s unpaid labor – without ever having to dig out a penny. People get upset over sweatshop workers slaving away – but they think nothing of being the sweatshop owner that profits every day from every blog. In fact, many people think that’s okay. When I attended the GGG this year, one of the realizations I came home with is that sometimes I feel like people are trying to get me to be less (more about this some other time). And, I remembered a session I had with a healer who did a somatic repatterning process with me—one of the beliefs she tested on me was, “I am not enough.” It got a marginal response, but then she tested, “I am TOO MUCH.” And, THAT is the one that tested as true. I wonder how much about myself that I try to change or that I struggle with actually comes from the fear of being, too much. Too intense. Too active. Too talkative. Too much thinking, too much writing, too many ideas, too many projects, too much waving of my hands and pacing when I talk. Too, too, too, too much. I can’t tell you how many people want to make a big positive change in their lives, but are afraid to make the leap. They don’t want the discomfort, don’t want to leave what they’re comfortable with. From losing weight or getting healthy to quitting a job you hate to learning something hard, most people would rather stick to what they know. I’m here to make a rather drastic but effective suggestion: burn down the farm. via Burn Down the Farm : zenhabits. Additionally, in a synchronicity that gave me chills, during the teleclass I was listening to just as I hit publish on part one of my post, ALisa Starkweather described that sometimes we feel “small” and sometimes we feel “big”—and that we are both. Sometimes we are small—both in terms of playing it safe, but also in being small-minded, or shrinking away—and sometimes we are big. We can hold both of them and bring them together, into integration, and accept that we have our small times and our big times and so do others. It reminded me of a conversation I had with a friend on Facebook a few weeks ago in which she mentioned sometimes feeling like she likes her “online self” better than her real self. I identified with what she wrote, because I have thought the same thing and have been heard to say more than once, “I think I’m a better writer than I am a person!! !” ::::sob:::: I also wrote a blog post a while ago that touched on this somewhat—I.e. is my online self my “real self.” I concluded that it was a part of my real self and that I am both more and less than I might I appear online! So, which is it? Am I authentic and open, or keeping my mouth shut all the time?! Maybe both. What I know is there is a lot I don’t write about. I don’t write because I’m too scared, or too sensitive, or too fearful, or too self-righteous, or too busy, or too annoyed, or too scattered, or too embarrassed. I don’t write things because I have relatives who read this or friends who read this and I’d rather not share some things with some people. And, which is it? Do I have nice energy and a gentle voice or am I a strident hospital-basher out to demonize and victimize?! And, I started to reflect that I guess I am all these things and how people experience me and my writing is in part up to me and in part up to them. Just like in real life. I can be gentle, kind, and nurturing. I can be critical, judgmental, and harsh. I can be helpful and I can be selfish. I can be patient and impatient. I can be friendly, I can be preoccupied. I can be energetic and enthusiastic and upbeat and I can be exhausted and defeated. I can be a fabulous, fun mother and I can be a distracted and grouchy mother. I can be funny and I can take myself too seriously. Different people, relationships, and environments bring out different expressions of who I am. Sometimes I really like myself a lot. I like who I am, I like how I move through the world, and I’m impressed with my own capacities. I have great ideas and solid values and principles and the ability to articulate those in writing. Sometimes I actually hate myself. I see only the bad parts and I wish I could just be better. I feel hypocritical and over aware of inconsistencies in my own thoughts/beliefs and my expression of my values in the world. I often want to be better than I am, but in rare moments of grace and self-compassion, I realize that I’m pretty good already. And, in some moments of self-righteousness and superiority, I actually feel better than some people in some areas/some ways! via The dualism of blogging (and life) | Talk Birth. A few years ago, such responses might have bothered me, but now…well, they still bother me a bit. (Hey, this is HALFway up the Mountain–I’m human after all!) They don’t get under my skin quite as much as they would have in the past, however, since I’ve come to this helpful, empowering realization: There will always be idiots. This may sound negative, but it’s actually incredibly liberating! It drives home an important lesson: You can’t please everyone! Once you fully realize this, you can stop trying! You can stop worrying, “What will ‘They’ think?”! You can stop letting your actions be determined by a handful of strangers–who are probably going to be negative no matter what you say or do! You can just be yourself, do your best, and live your life. It’s also incredibly empowering to remember that just because someone offers bait, doesn’t mean that you have to take it–in person, on Twitter, or anywhere else. You can let them put in their two cents of negativity and leave it at that. You can just let it go, or you can choose not to take it in at all. via Dan Teck | Halfway up the Mountain. And so we live our lives committed to pleasing everyone because when they are pleased, they will approve of us, praise us, and love us. It makes so much sense that we would live our lives in this way – who wouldn’t want to feel loved? But what I realized is the cost of getting this love was absolutely exhausting. Even though I tried very hard to not upset anyone, I found that I still would. While it was rare, I would sometimes receive phone calls from angry people saying that I didn’t do x, y, and z quickly enough or well enough or in the right way. I would receive emails saying that I wasn’t soulful enough or caring enough or loving enough. And sometimes I could. But oftentimes I couldn’t. via Four Words to Free Your Soul – Heart of the Soul. This thinking about blogging and life and work, also has me thinking about technology and its role in my life. Its contribution to my feeling “sped up” and fragmented. I’ve been talking for months now about creating a Say NO Experiment, in which I spend 30 days saying no to as many things as I can (many of which catch my eye online). However, since I haven’t ever started that experiment I signed up to participate in this cool sounding teleseminar: Red Tent Revival. Something caught my eye there though and it was the notion of saying YES to life. I feel like lately everything operates under this yes, yes, yes buzzphrase and yet I am struggling with the courage to say NO. It is popular to advocate grabbing life by the horns, seizing the moment, etc., and yet my default reaction is almost always YES. And, then, I have to backtrack back to the NO that actually wants to be heard! So, then I read this beautiful post from Hands Free Mama (who I love, even though every time I read her I find myself noting the irony that she has built her business on the internet essentially around critiquing parental use of technology). If I live to be 100, it will not be because I could accomplish more in one day than most people could in a week. It will because I took time to gaze at stars, watch sunsets, and walk beside my children, not ahead of them. If I live to be 100, it will not be because I earned prestigious degrees that adorned my walls. It will be because I pursued the passions of my heart and decorated my soul. via If I Live to Be 100 | Hands Free Mama. I don’t want to model the perfect mom who doesn’t exist and hide the rest of my life from my kids. I want to model the balanced (and sometimes unbalanced) normal mom who loves them very much. And today, part of normal = tech user. It is time for society to realize that. via Oh those technology obsessed neglectful parents… – PhD in Parenting – PhD in Parenting. I have to say that when I read content decrying technology as negative and lamenting the abundance of children on their “devices,” part of me hears: “these new-fangled kids driving cars instead of good old horses and buggies!” This is reality. In my specific family, technology and screen-time built my family’s financial security and our literal home. My husband made a living for years off of screens—eight hours a day in front of one in fact. I use one now to support my family and to, get this, be with my children. Using a computer (ipad, etc.) is how I teach, how I write, how I communicate, how I interact, how I earn money, how I sell my creations. My mom was on the phone a lot when I was a kid. I’m on the computer a lot. Maybe Idealized Mythical Past Mom was in the cotton field a lot, or washing laundry for others, or working in a lace factory, or milking cows, or shelling peanuts or making paper flowers, or keeping up the house, or taking care of younger children, or, or, or. Moms have never “not worked.” And, they’ve never been non-“distracted,” just the mode and texture of this “distraction” shifts with times, contexts, roles, activities, and availability of whatever. Perhaps it is all just life and living?! I am as interested by mindfulness and present moment awareness as the next person and yet I always wonder: “can’t I be typing this blog post in the present moment? !” Can’t I be thinking about my to-do list in the present moment? Can’t I be smelling this rose in the present moment? AND, can’t I also be sending this text in the present moment? Why does “present moment” have to be synonymous with no to-do list and no technology? I can very presently us both…right?! Moms read books, watch TV, fold laundry, nurse babies, follow around toddlers, talk to friends, weave baskets, bake bread, cook meals, and yes, write blog posts and check in with their online classes, while simultaneously being with their children. It is interesting that only the activities involving technology/screens are portrayed as or described as “being distracted” and not “present” with parenting. When I had my conversation with my mom yesterday about coming from a noble line of busy women, she told me about a skit that she was involved with as a child (part of Girl Scouts? I forgot already! Too distracted!). It was a Mother’s Day skit and each girl portrayed her own mother as a parody. My mom, fulfilling the role of her mom, talked on the phone the whole skit and said, “just a minute kids,” at periodic intervals. This was in those “good old days” of the 1950’s, often romanticized today as heyday of the “traditional family.” Today, skit-mom would be saying, “I need to update my Facebook status!” (or, something). This is NOT to say that mindfulness in parenting and connection with children is not important—not at all, what I AM saying is that this is not a “new,” technology-specific parenting experience. My own mom talked on the phone quite a bit and she also wove baskets and worked on craft projects and had tea parties for my little sister and helped my brother with costumes and talked to my dad and visited with her friends, and, and, and. ALL of those things “distracted” her from specifically talking to/interacting with ME, but, why not? It is part of living in a family and being part of a system of complex, multifaceted, multitalented, multi-interested, real people. In my own family now, that includes an ipad and iphone and a computer, as well as many, many other things. New pewter work! I ❤ her! My to-read pile by the bed. My to-read pile near the bed. Free-range husband felting a wizard hat. Ready to go to a party!